The author focuses on analysing the external and internal contexts of the functioning of modern higher education institutions. She analyses changes in approaches to managing universities, taking into consideration public organization management models, public policies, the changing definitions of the roles played by universities in social and economic development, as well as management concepts and methods. The author characterizes the essence of the process approach, defines the specific qualities of processes conducted in higher education institutions, as well as new approaches to their classification. She also discusses process management concepts followed in universities, e.g. Total Quality Management (TQM), Business Process Reengineering (BPR), and Business Process Management (BPM). She also presents the essence of Lean Management and the conditions for implementing this concept in higher education institutions. The chapter ends with a proposal for a Lean university model. Collis, D. (2016, March). Lean strategy. Harvard Business Review. Downloaded from: https://hbr.org/2016/03/lean-strategy. Accessed 15 May 2018. Francis, D. E., Krehbiel, T. C., & Balzer, W. K. (2017). 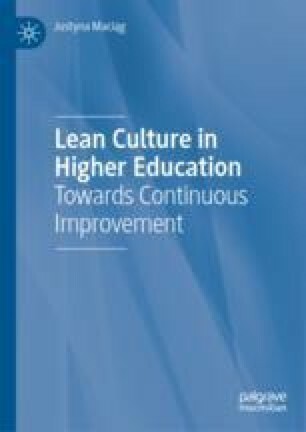 Lean applications in higher education. Downloaded from: https://the-lmj.com/2017/03/. Franz, P. H., Kirchmer, M., & Rosemann, M. (2012). Value-driven business process management impact and benefits. Accenture. Downloaded from: https://www.accenture.com/mx-es/~/media/Accenture/Conversion-Assets/DotCom/Documents/Local/es-la/PDF2/Accenture-Value-Driven-Business-Process-Management.pdf. Accessed 25 May 2018. Helbing, D. (2016). Innovation accelerator: Why our innovation system is failing—And how to change this working paper. Downloaded from: https://www.researchgate.net/publication/305969593. OECD Science. (2016). OECD Science, Technology and Innovation Outlook. Paris: OECD. Downloaded from: http://www.keepeek.com/Digital-Asset-Management/oecd/science-and-technology/oecd-science-technology-and-innovation-outlook-2016_sti_in_outlook-2016-en#. Peter, H. F., Kirchmer, M., & Rosemann, M. (2012). Value-driven business process management impact and benefits. Downloaded from: https://www.accenture.com/mx-es/~/media/Accenture/Conversion-Assets/DotCom/Documents/Local/es-la/PDF2/Accenture-Value-Driven-Business-Process-Management.pdf. Process Classification Framework Version 6.1.1. American Quality Productivity Center. Downloaded from: http://www.apqc.org/knowledgebase/download/313690/K05162_PCF_Ver_6%201_1.pdf. Accessed 7 February 2015.